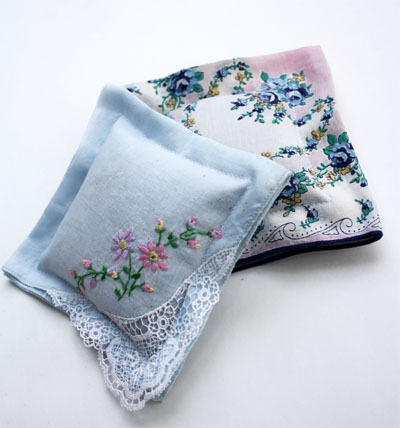 I have a few hankies saved from my grandmother and decided to turn them into something useful. I think these would make the sweetest Mother’s Day Gifts. No worries if you don’t have handkerchiefs. Antique stores usually have a great selection for about .50 cents to $2.00 each. Take one handkerchief and lay it out flat. 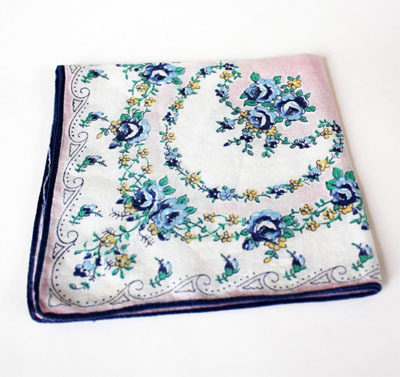 Fold the handkerchief in half and then half again. Line up all edges and press. 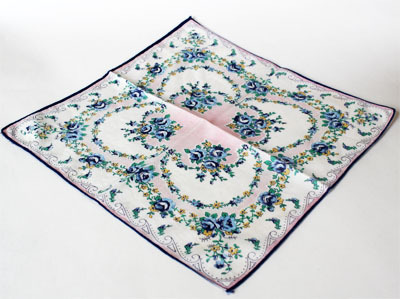 The handkerchief could have been cut, but I just couldn’t bear to cut into the hankies. I also liked the sachets thicker and didn’t want to have to finish raw edges. Machine stitch around the handkerchief about a half inch from the edge (on larger hankies I sewed 1 inch from the edge). Leave a one inch opening on a side that can be filled. I left the opening on the first fold adjacent to the last fold (see picture). 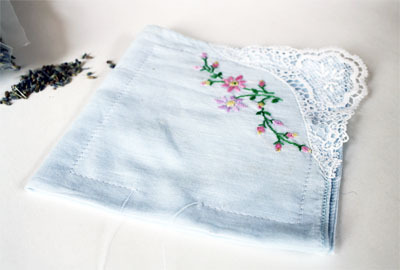 Fill handkerchief with dried lavender (I found mine at Save On Crafts). A funnel makes this go quickly. If you don’t have a small plastic funnel a piece of paper rolled into a cone works also. Don’t overfill as it will make it harder to sew sachet closed. Close opening by finishing stitching line. 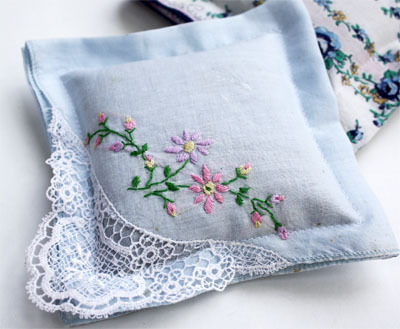 The stitching line could also be embellished with hand embroidery.